These chairs are very comfortable, even without a cushion. They are great looking by our pool and seem to be very well made. They arrived very quickly and were packaged very nicely, no damage whatsoever. I would highly recommend these and will possibly buy more myself! This new aluminum chaise lounge has all the features of a top quality wicker lounge with the added benefit of an aluminum frame. The aluminum frame won't rust which will prolong the overall life of your lounge. This lounge also features top quality wicker which will hold up to the elements much better than your run of the mill wicker. Overall, this lounge does it all and is very comfortable, to help seal the deal. I love the high end look of these chairs, but also that I can easily move them by myself! The recline feature of the chair is incredibly simple, unlike other loungers I looked at. Really pleased! I have purchased several different types of lounge chairs for around my pool through the years and these are my very favorite by far. They are so comfortable for lounging, tanning or even napping. I have back problems and that is not something that I say easily. The color, quality, design and price of the chair are all great. I will definitely recommend this product to my friends and family. I really like the look and feel of this patio chair. Compared to what was on other sites this was well priced. The frame is aluminum, which was a key factors in my decision to order. 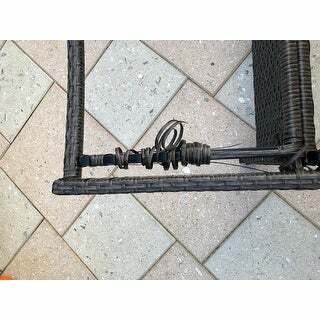 I was disappointed the wicker on one chair arrived coming apart. Overstock amsaid they would replace it. I trust they will and will update the review accordingly. These chaise lounge chairs exceeded my expectation. Not only are they absolutely beautiful and classy but they are also very comfortable, even without cushions! I am so very pleased with this purchase and I would highly recommend these chairs! These wicker chaise lounges were very well made and the color blended with other furniture that I already had. Both brown and black!! I would recommend these to anyone who is needing to start their pool furniture collection or adding too!! Looking forward to entertaining to show these off!! Love these loungers. Comfortable but would be even better with a cushion. At the base of the lounge is a gap between my back and the lounge, I think a cushion would solve that. Very appealing and sturdy. These chairs are exactly what I thought they would be. No assembly required, they came ready to go. The wicker seems durable and like it will last. Very comfortable and I just ordered the cushions for them for added comfort and looks! These chairs are comfy and great, but do not last more than a year. The do not last outside through all the seasons. They are not that expensive so I just bought new ones as it is the only thing that matches my other pieces outdoors. Great deal on these chairs. Fast shipping. The chairs are beautiful. They are also very comfortable. Hopefully they will hold up for many years to come !! One Chaise was damaged and had to return. Hopefully when we receive the set everything will be ok. Weight Capacity for this item is 250lbs. Nice wicker set and I'm hoping it's rust proof. Good reviews. Sale price. Wanted Wicker but needed the Aluminum for rust purposes in Florida. Like the look of the chaise loungers.